What Else Can I Expect From an Online Bachelor's in Graphic Design Program? Graphic designers are the creative minds behind the visuals we see every day, from corporate logos and website layouts to the images found on T-shirts and car decals. Although employees in the field have traditionally worked by hand, most graphic designers now generate their visual concepts digitally. According to the Bureau of Labor Statistics (BLS), roughly 10% of graphic designers in the U.S. work for specialized design services. Other employers include advertising agencies, print studios, and publishing agencies. Graphic design as an academic discipline is grounded in three expressive techniques: typography, photography, and illustration. Students learn different methods and strategies for combining these three art forms into memorable visual products, as well as editing and evaluating their work. A bachelor's degree is sufficient for most careers in graphic design. Many of today's undergraduates are choosing to earn their graphic design degree online, rather than in a classroom-based program. Online students complete the same rigorous curriculum as their brick-and-mortar counterparts and enjoy the same professional opportunities upon graduation. Additionally, the distance format is ideal for students who must balance their coursework with part-time employment, childcare, or any other important commitments. Read on to learn more about the material covered in a graphic design program and what kind of career opportunities you can look forward to with a bachelor's degree in the field. CAN YOU GET A GRAPHIC DESIGN DEGREE ONLINE? Yes. Graphic design degrees are available in fully-online and hybrid formats. Read more here..
HOW MUCH DOES AN ONLINE GRAPHIC DESIGN DEGREE COST? The cost of an online graphic design degree depends on several factors, including residency status. Most students can expect to pay between $220 and $550 per credit. Read more here..
Graphic designers can work in private design firms, advertising agencies, publishing houses, or as freelancers. They might design graphics for websites, publications, advertisements, or related media. Read more here..
WHAT DEGREE DO YOU NEED TO BE A GRAPHIC DESIGNER? Most positions in the field require a bachelor's degree in graphic design. Read more here..
DO YOU NEED A DEGREE TO BE A GRAPHIC DESIGNER? While a certificate may qualify candidates for certain positions in the field, generally an associate or bachelor's degree is required. Read more here..
WILL AN ONLINE BACHELOR'S IN GRAPHIC DESIGN PROGRAM PROVIDE ME WITH THE SKILLS I NEED TO ADVANCE MY CAREER? Online graphic design courses expose students to artistic techniques and software platforms commonly used in the industry, such as drawing, drafting, 3D modeling, and computer animation. Students also learn how to compile and manage a professional portfolio. Online graphic design programs are often delivered in an exclusively web-based format, and students are rarely required to enroll in on-site practicum courses. WILL AN ONLINE BACHELOR'S IN GRAPHIC DESIGN WORK WITH MY SCHEDULE? Online bachelor's in graphic design programs offer a flexible, cost-friendly alternative to traditional campus-based education. The asynchronous schedule allows students to access lectures and other course materials, submit assignments, take exams, and communicate with faculty members on their own schedule. Current technology also enables them to study away from their home computer using a laptop, tablet, smartphone or other Wi-Fi-compatible device. WHAT JOBS CAN I GET WITH MY BACHELOR'S IN GRAPHIC DESIGN? A bachelor's in graphic design will qualify graduates for most entry-level positions at private design firms, advertising agencies, publishing houses, and other organizations that normally employ degree-holders in the field. Students who earn a degree concentration may also be eligible for specialized roles related to their area of study. Popular minors or degree specializations for graphic design majors include web design, computer-aided design (CAD), illustration, animation, and marketing/advertising. WHAT ARE THE BEST ONLINE BACHELOR'S IN GRAPHIC DESIGN PROGRAMS? Choosing a program is a very personal decision, and only you can properly evaluate whether a target school's strengths match your educational needs. The following ranked list of schools should serve as a helpful starting point in your search for the best online bachelor's in graphic design programs in the United States. 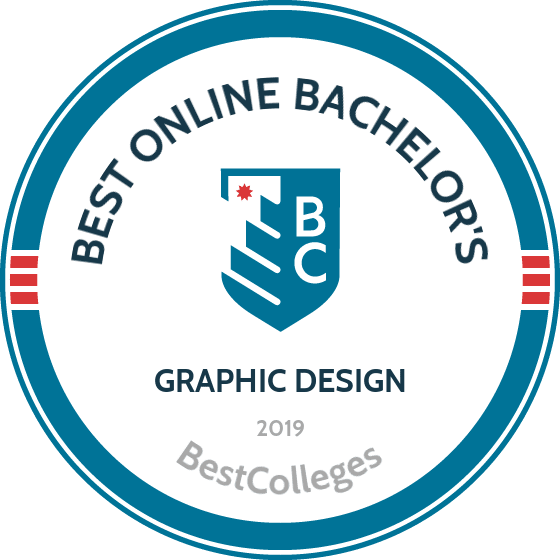 If you are interested in pursuing an online bachelor's in graphic design, be sure to take a look at these top colleges. Liberty University offers one of the best and cheapest online graphic design degrees in the country. Students in Liberty's bachelor of fine arts in graphic design program complete 73 credit hours of intensive graphic design classes, along with a general education core and three Christian-focused courses. Learners use industry-standard software programs in courses such as vector illustration, publication design, and typography. The curriculum also includes on-the-job training in the form of a 180-hour internship and a 30-hour practicum. While earning the online graphic design degree, students develop an extensive portfolio, which graduates can use to secure employment. Liberty delivers the program in flexible, asynchronous courses that each last eight weeks. Because students do not need to log in at set times, the program is ideal for busy students with personal or professional obligations. Liberty accepts applications on a rolling basis and offers eight start dates throughout the year. Applicants must have a minimum 2.0 GPA and must submit proof of English proficiency, a high school self-certification form, and official college transcripts, if applicable. All students pay the same affordable tuition rates, regardless of state residency, and online learners receive free electronic textbooks. Liberty offers tuition discounts for military students and their spouses. Southern New Hampshire University offers a flexible BA in graphic design and media arts that is ideal for working professionals and other busy students. SNHU's small class sizes and award-winning faculty members ensure each online student receives personal attention. The 120-credit online graphic design degree offers a general graphic design track; students can also pursue a concentration in web design or 3D modeling and animation. The curriculum includes general education courses and a major core. Students gain a foundation in basic design principles and media production concepts before completing advanced coursework in areas including print and digital design. Learners in the general track study topics including basic design and color theory, digital graphic design for the web, and graphics and layout for print media. Students complete coursework asynchronously and can access course materials and lectures at all hours. SNHU offers a generous transfer policy; students can apply up to 90 previous credits toward the online graphic design degree. All online learners pay the same affordable tuition rates, regardless of state residency. Applicants must submit only an online application. SNHU charges no application fee, retrieves U.S. college transcripts on each applicant's behalf, and provides official credit evaluations at no charge. Bellevue University offers an interdisciplinary bachelor of arts in graphic design that prepares graduates for positions in marketing, advertising, communications, and product packaging design. While earning their graphic design bachelor degree online, students develop an extensive professional portfolio of print and digital projects. Graduates use these portfolios to communicate their skills and abilities to prospective employers, clients, and graduate admissions departments. The 127-credit program requires 36 general education credits, 49 elective credits, and 42 major credits. Students take classes in areas including the history of graphic design, problem-solving and idea generation, print publication design, web page design, branding, and typography. Students apply critical-thinking skills to explore global, social, and ethical issues of graphic design. Learners also develop creative visualization skills and become familiar with software including Adobe Illustrator, InDesign, Photoshop, and XD. BU welcomes students pursuing a second bachelor's degree, making the online graphic design degree ideal for individuals seeking a career change. All online students pay the same per-credit tuition rates, regardless of state residency. Active-duty military members and their spouses receive a tuition discount. Applicants must hold a high school diploma or the equivalent, and transfer applicants must submit official college transcripts. BU accepts transfer credits, but learners must complete at least 30 credits through Bellevue University. While many professionals view graphic design as a fine arts discipline, graphic designers often apply their skills to roles in marketing and advertising. Midway University offers an online bachelor of science in marketing communications with a concentration in graphic design. The curriculum includes a 39-credit major core comprising courses such as public relations, principles of marketing, digital and social media, and consumer and audience analysis. The 18-credit graphic design concentration requires coursework in drawing, Photoshop, digital storytelling, and animation. Students also complete general education courses and 23-29 credits of open electives. To support student success and improve the accessibility of faculty members, Midway University maintains a 16:1 student-to-teacher ratio. Online students who live near the Kentucky campus can schedule in-person meetings with professors. Full-time students typically complete the program in four years, and all online learners pay the same affordable tuition rates; full-time students pay a per-semester rate, and part-time learners pay a per-credit rate. The university accepts transfer credits and awards up to 21 credits for prior learning outside the classroom, reducing credit requirements and overall cost for experienced professionals earning their online graphic design degree. Applicants must hold a minimum high school or college GPA and must submit official transcripts and SAT or ACT scores. California Baptist University offers a bachelor of arts in graphic design and digital media, which students can complete in as few as 16 months. Learners gain foundational knowledge of graphic design, web design, photography, and portfolio-building. The program also addresses moral and ethical questions related to the graphic design industry. Graphic design students use professional software programs including Adobe Photoshop, Illustrator, InDesign, and Dreamweaver. The curriculum includes 48 units of fundamental and advanced coursework in topics including drawing, composition, design, typography, image, and web. CBU offers a flexible transfer policy; the university accepts up to 100 transfer units from eligible institutions, and learners can transfer up to 70 units from community colleges. Additionally, CBU partners with more than a dozen community colleges to offer a fast track program, which provides a tuition discount scholarship and an application fee waiver to eligible students. CBU recommends that applicants to the graphic design and digital media program have at least 24 transfer units, but the university requires only a high school diploma or equivalent. Applicants must have a minimum 2.0 GPA and must submit official transcripts. Prospective students receive assistance from admissions counselors and academic advisers throughout the application process. SCAD is a private, nonprofit university with five campus locations in Georgia, Hong Kong, and France. The institution offers more program and specialization options than any other art and design university in the world. SCAD students pursuing their graphic design bachelor's degree online can earn a bachelor of arts or a bachelor of fine arts. Each program requires 180 hours of general education coursework, foundation studies, major classes, and free electives. The bachelor of fine arts program emphasizes graphic design, while the BA program has a broad focus on visual communication with a focus on graphic design. Each program includes courses in typography, idea visualization, and media management. However, the BFA curriculum requires additional courses in graphic design entrepreneurship and the creation of a student portfolio. BFA and BA students complete 25-35 credits of foundation studies in drawing, color theory, and composition. The university's graphic design faculty boast experience with organizations including the Walt Disney Company, MTV, and American Express. SCAD delivers online coursework asynchronously, and learners can access course materials at all hours. Applicants must typically submit ACT or SAT scores, official high school or college transcripts, letters of recommendation, a portfolio, and a statement of purpose. Prospective students must apply at least 30 days prior to the start of their intended enrollment quarter. Kentucky Wesleyan College is a private, nonprofit institution and offers an online BA in graphic design. Designed to meet the needs of full-time professionals, Wesleyan's asynchronous online courses last seven weeks each and allow learners to access course materials at all hours. Wesleyan limits online students to part-time enrollment, with a maximum of two courses per term. The online graphic design degree requires 120 credit hours, including 39 general education hours, 42 open elective hours, and 39 major hours. Students complete foundational and advanced graphic arts courses on topics including drawing, typography, branding design, web design, print publication, and animation. Students in the fully online program develop a portfolio of advanced projects and gain practical experience through two internship courses. New online terms begin every two months, and the admissions department accepts applications on a rolling basis. Applicants must submit official high school transcripts, a GED certificate, and/or college transcripts, and prospective students pay a $100 tuition deposit to reserve their spot in a cohort. Transfer students can bring up to 90 credit hours from a four-year institution or up to 60 credit hours from a two-year college. Prospective students can submit unofficial transcripts for a free credit evaluation. All online students pay the same affordable tuition rates, regardless of residency. When searching for the right online graphic design degree, it's important for students to remember that each school or program is unique. Classes, credit requirements, accreditation, cost, and instruction method can all vary depending on the program. Digital and Web Graphic Design: From Photoshop basics to high-end web coding, classes on graphic design for the digital age are a must. Students can choose one or many digital design courses based on whether they want to pursue online publishing or a more analog career. Graphic and Interface Design: Often taught in introductory and then advanced forms, courses on graphic design and interface design are degree staples. Students learn theory and technique and follow modern innovations. Drawing: Drawing courses are at the core of any graphic design program. Online degrees at art schools often feature multiple drawing classes while traditional colleges may only feature one or two. These classes hone student's core abilities. Color Theory: Color theory is a foundational class. It's particularly important in marketing and web design. Students learn how colors affect human behavior and other theories. HOW LONG DOES IT TAKE TO GET AN ONLINE BACHELOR'S IN GRAPHIC DESIGN? Earning a graphic design degree online typically takes about four years. Depending on whether the graphic design online degree is a BFA, BA, or BS, there may be various course and general education requirements that will impact completion time. Programs usually require between 120 and 180 credits to graduate. Completion time for graphic design schools online can also be impacted depending on if a student is enrolled full-time or part-time, if the program is offered in an accelerated format, and whether the school gives some form of transfer or experiential credit. Most graphic design programs use an individual pacing model, where students decide their own speed, versus a cohort learning model where students follow a set group pace. With online graphic design degrees, it's important to know whether or not a program is accredited and what that means. Online programs or schools are accredited when they meet a certain set of criteria set by the government, industry groups, and peer institutions that prove the value of the education and worth of the degree. There may be some small art institutes and schools that do not meet these criteria and therefore carry less weight with employers and peers. Schools are either accredited nationally or regionally. Online and distance learning institutions are often accredited nationally by approved organizations. The Council for Higher Education Accreditation (CHEA) is a nongovernmental agency run by leaders of peer higher education institutions that analyzes and accredits colleges and universities. Traditional brick and mortar schools and many of their online programs are accredited by regional agencies that are recognized by the Department of Education and the CHEA. The Department of Education does not accredit schools but acts in an oversight role and recognizes legitimate agencies. This allows for agencies to act privately but with public approval and oversight. Some programs are accredited separately than the rest of the school. For example, law programs are accredited by the American Bar Association. Graphic design does not have a comparable accrediting group. Learn more about which schools are accredited on the Department of Education's website and the CHEA's. According to a 2014 survey by Georgetown University's Center on Education and the Workforce (CEW), the job outlook for graphic design majors has steadily improved in recent years. In 2009-10, bachelor's-holding graphic designers with work experience had a 7.5% unemployment rate, while inexperienced bachelor's graduates faced an unemployment rate of 11.8%. Two years later, both of these figures had fallen, to 6.8% and 9.9% respectively. Both of these unemployment rates are significantly higher than the national unemployment rate for all occupations (5.0%). It's important to note, however, that job placement rates for graphic designers are on par with the rates from other professional fields in media arts. The following table compares the unemployment rates of employees with different art-oriented bachelor's degrees. Graphic designers with a bachelor's degree enjoy higher earning potential than their colleagues with less education. Using data from the 2015-16 PayScale College Salary Report, the table below compares salary expectations for associate and bachelor's degree-holding graphic designers at two key career benchmarks. As the table indicates, graphic designers with a bachelor's degree outearn associate-holders in their field by 23.1% at the entry-level mark and 34.3% at mid-career. The next table explores earnings for different graphic design professionals throughout their careers. The average career salary growth for the five careers listed on the table is 56.9%. Of all five careers listed, illustrators enjoyed the highest growth at 72.3%, followed closely by multimedia artists and animators at 70.0%. Students who graduate from college with a bachelor's degree in graphic design will leave school qualified for dozens of jobs in the industry, although your eligibility for specific positions will depend on a variety of factors, such as your job title and where you live. Below, we covered four of the most common career paths for graphic design graduates. Graphic Designers generate the visuals and interactive materials found in web and print media. Most graphic designers are well-versed in multiple artistic platforms ― such as illustration, animation, and 3D modeling ― and can use a range of tools and software-based programs. These managers oversee the various visual and media elements of advertising campaigns, promotions, and other programs designed to inspire public interest in products, individuals, organizations, and events. They offer input on color schemes, fonts, and graphics used in banners, billboards, and other marketing materials, along with email campaigns, surveys, and other platforms used to reach out to consumers. These professionals conceive and produce animated design projects used in advertising, entertainment, and education. They draw from a range of tools, from sketchpads and 3D models to software programs and web-based design platforms. Web developers generate the technical and multimedia components of websites, apps, and online games. Some specialize in 'back-end' programming components, while others produce 'front end' visual graphics and interactive software. They also work to improve site functionality and create a positive experience for web users. Making professional connections and learning about different approaches to graphic design is crucial to your success. Professional organizations offer a great entry point for students who want to learn more about their chosen career path. Below you'll find three of the country's most prominent organizations established for graphic designers. These organizations host networking events, provide online trainings, maintain active job boards, and offer other services for career-ready college graduates. Considered the oldest and largest professional organization for commercial designers, the AIGA represents more than 25,000 members in 70 chapters throughout the United States. Member benefits include discounts on professional development courses, and invitations to networking events. This Toronto-based organization strives to promote education, mentoring, and advocacy among the graphic design community. Students receive full membership for a discounted rate. Founded in 1967, this New York-based association of web designers, graphic artists, and illustrators features five regional U.S. chapters. Members receive resources for successful networking, freelancing opportunities, and discounts on courses.